Police have released six images of men they would like to speak to in connection with violence and disorder during the Tottenham Hotspur vs West Ham United match, which took place at Wembley Stadium on Wednesday, 25 October. A number of police officers were attacked as they attempted to separate two groups of rival fans who were attempting to kick through a set of gates in an internal concourse of the stadium. 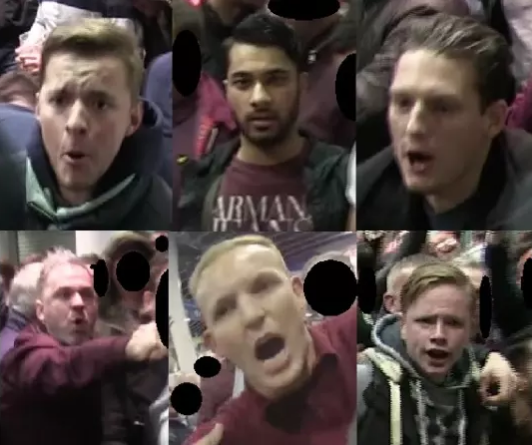 The six men in the images released are all believed to be West Ham fans. Detective Sergeant Matt Simpson, from the Specialist Crime and Operations Public Order Branch, said:“Violence towards police officers will not be tolerated and it was extremely fortunate that no one was badly injured. Anyone who recognises any of the individuals in the images should contact the investigation team on 020 8246 9386 quoting the image reference number or alternatively call Crimestoppers anonymously on 0800 555 111.